Construction waste management and disposal can be a headache for working teams. At the end of the shift, when the waste has to be removed from the site, the team must find a way to safely and effectively move glass, plastics, and other materials, for the site to be in the optimal condition for the coming days. 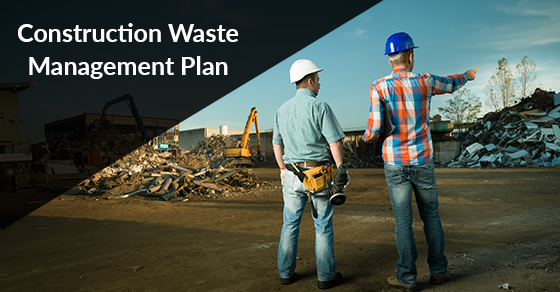 To help guide you as your team takes on the construction waste management process, we’re highlighting four tips for an effective constructive waste management plan. One of the first steps for dealing with waste on a construction site is to limit the amount of waste created during the project. Make sure that you plan carefully before you begin the project, and only order the requisite amount of materials you need to complete it. Measure every element as accurately as possible, and work with material experts to ensure precision. The next step in the process is to create a plan for segregating the waste on the site. Some waste, such as cardboard, paper, and some metals, can be recycled by a local construction waste disposal company. Segregating the waste by type will also ensure that materials can be reused effectively without the team having to search all over the site. This will save time as well as money in the building process. The waste management plan should take into consideration the various phases of construction and the type of waste that will be produced during each phase. For example, when completing the window work for a building, companies should have a plan for dealing with the waste framing materials and glass. This will help ensure that teams remain focused on waste throughout the process and eliminate mistakes made during sorting. The final part of an effective construction waste management plan is to ensure that materials can be recycled at the culmination of the project. Work with trusted construction waste disposal teams to ensure they can pick up and dispose of the waste once the construction work is completed. You might also discuss regular waste removal from the site for projects that will take place over several months. Our experts are here to help guide you on your full range of construction waste disposal options. To learn more about how to manage the waste created during upcoming projects, call our team for a consultation today! This entry was posted in Construction Waste on December 13, 2017 by Junk King. Last updated December 4, 2017 .